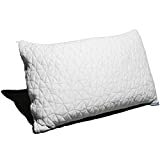 BACKED BY THE COOP HOME GOODS GUARANTEE - We guarantee you'll love the pillow, and if you aren't absolutely satisfied, return it within 100 days for a refund, no questions asked. A 5-year limited warranty on any workmanship and/or material defects. This warranty is provided when care instructions are followed.